Originally $8.95, Now $4.95! We at Laughing Elephant ascribe to the philosophy that everything in one's life should be as beautiful as possible. This seems an especially appropriate rule for those little essentials women tend to carry in their bags: cosmetics, a brush or comb, a case for one's glasses. Thus we have created Lovely To Look At pocket mirrors graced with beautiful and appropriate images. The mirrors close with a magnetic clasp, so they remain protected in the often dangerous environs of a purse, but open with a mere flip of the finger. 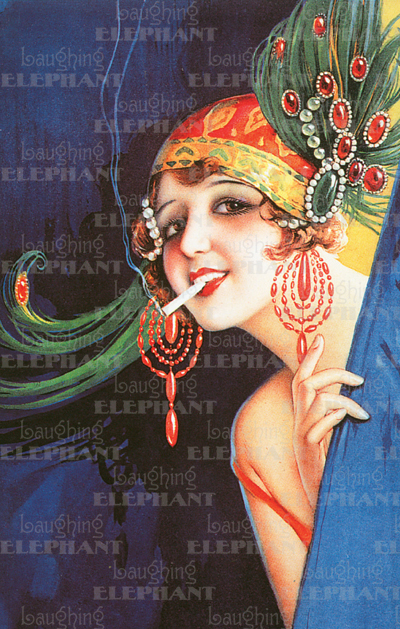 The mirror cases are made from sturdy cardboard covered in laminated paper, this particular one features a stylish smoking 1920s flapper with a cigarette.